U.S. President Barack Obama called on Burundi's leaders to take part in talks to end the country's political crisis and halt a growing wave of violence, in a statement given to VOA. The president spoke in a video message addressed to the people of Burundi, broadcast early Saturday on VOA. Obama said killings of innocent people and "hateful rhetoric" from leaders is jeopardizing the Central African country's future. The Civil War. 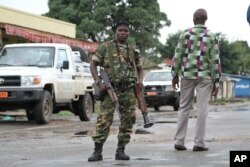 Burundi endured a 12-year civil war, fueled by tensions between ethnic Hutus and Tutsis, that killed some 300,000 people. Diplomats fear a repeat if current violence is not checked. Term Limit Controversy. Burundi's constitution limits the president to two terms. But President Nkurunziza ran for (and won) a third term this year, setting off violent protests and a failed coup attempt. Assassinations. Several military and political figures have shot dead or wounded since August, including the president's chief of security, the former head of the military, and the spokesman for an opposition party. The Refugees. The UN says more than 215,000 Burundians have fled to Rwanda or other neighboring countries. Government Intimidation. Diplomats have expressed alarm at government rhetoric and a disarmament campaign that is targeting opposition strongholds. He urged the government to halt the rhetoric and engage in an internationally-mediated dialogue, outside the country. The president also appealed to Burundians to stand against violence and work toward unity. "After civil war and strife, you've worked to rebuild. You've seen the possibility of a better, more peaceful future," he said. "Don't let political rivalry or the voices of hate take that away from you." On Thursday, the U.N. Security Council passed a resolution calling on Burundi's government to engage in a dialogue with opponents, to be mediated by Ugandan President Yoweri Museveni on behalf of the East African Community. The government has said it supports an "inter-Burundian dialogue" but has not committed to any specific talks. The resolution also threatens sanctions against anyone seen as obstructing peace and fueling violence in Burundi. Possible measures include travel bans and asset freezes. Envoys have also discussed sending U.N. peacekeepers into Burundi in case the situation deteriorates. The United States, European Union and Burundi's neighbors fear the violence could result in another civil war between Tutsis and Hutus -- the same kind of fighting that brought on the 1994 Rwandan genocide that killed some 800,000 people. Authorities in Burundi, however, said this week the country is "not in flames," and that there is no chance for mass murder. Burundi's President Pierre Nkurunziza is sworn in for a third term at a ceremony in the parliament in Bujumbura, Burundi, Thursday, Aug. 20, 2015. In his video message, President Obama urged Burundi's military to stay out of political conflicts and help keep the country at peace. The situation grew more tense this month when the government told Burundians to hand in all illegal firearms. President Nkurunziza warned those who did not comply would be treated as "enemies of the nation," while the president of the Senate used the term "pulverize" to describe what would happen to opponents who ignored a government deadline.